Since Brandi is living it up in Costa Rica, we asked a few friends to step in and help me out this week on MMBB. First up is a yummy recipe from our friend Alexandria Nolan from Greetings from Nolandia. Alexandria is a misplaced Michigander currently living in the wilds of the Houston urban jungle. Her blog focuses on health, fitness, travel and relationships. When she’s not writing, she’s getting fit, traveling or having a relationship with her husband, Terrence and her cat, Jables. So with that in mind, today’s recipe is one of my all-time favorite go-tos, and it even works as a ‘cheat’ recipe on Brandi’s diet. It’s vegetarian friendly, has complex flavors, and it fills up hungry men and ladies alike. As potatoes bake, heat black beans and stir in cumin. 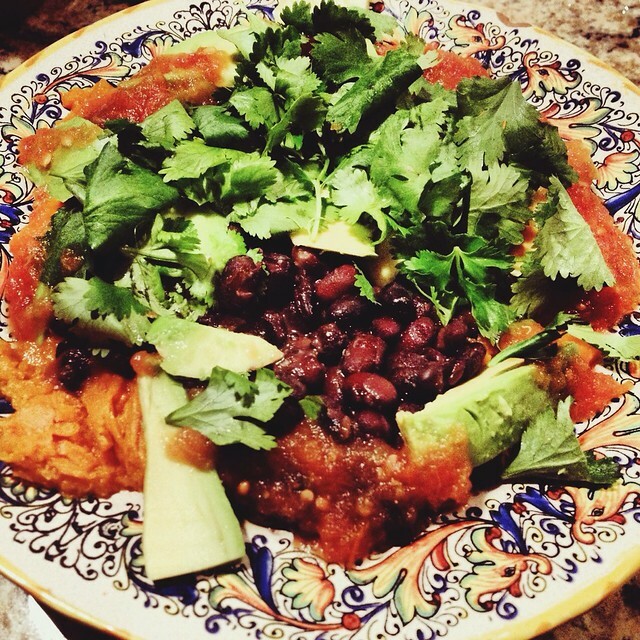 Layer each potato with the heated black beans, salsa to taste, sliced avocado and cilantro on top. We like A LOT of cilantro on ours, and it’s full of vitamins A and C, so feel free to add as much as you dare. This recipe is also packed with fiber, protein and healthy fats from the avocado. My grandma would call it “a gut stuffer” because even though it’s super healthy, it’ll totally fill you up.